Last year, a new translation of the Lithuanian writer and socialist Petras Cvirka’s 1934 novel Frank Kruk came out. It is among his best-known works, the bizarre and comical story of a Lithuanian emigre to the US which satirised capitalism and American culture. Deep Baltic has an extract from the book, but first, translator Elizabeth Novickas puts the novel in context and tells us a little about Cvirka’s extraordinary life. Petras Cvirka’s comic novel Frank Kruk, first published in 1934, is a long, leisurely novel (in two volumes) of the type written in the era before television was invented. The horrors of the First World War were already almost twenty years in the past, and Hitler’s war yet to come. It was a golden age for comic writing: P.G. Wodehouse, Stella Gibbons, and James Thurber spring to mind, and even Ilf & Petrov gamboled in the vast steppes of Russia. In this debut novel, written when he was only twenty-five, Cvirka took aim at a subject that remains relevant in Lithuania to this day: emigration. In his story, the protagonist flees to America after a drunken fight results in a stabbing death. Various jobs, misadventures, and disappointments follow before the farmer’s son Pranas Krukelis completes his transformation into the successful businessman Frank Kruk and becomes the proprietor of a Brooklyn funeral parlor. Emigration exerted an ambivalent attraction in the thirties (just as it does today, although contemporary writers are more likely to write about experiences in Britain and the EU than America). Although it presented opportunities unavailable at home, it also sometimes impoverished both those that risked it and those that stayed behind. Classics of Lithuanian literature include Antanas Vienuolis’s “Paskenduolė” (The Drowned Girl, 1933), about a pregnant girl whose boy has left for America; a creepy story from Antanas Tulys, “Paskutinis pasimatymas” (The Last Visit, 1936), about a Lithuanian-American who returns to his homeland and comes to believe his half-brother and mother are plotting to kill him so he won’t take over the family farm; and Vincas Krėvė’s story “Vis toji Amerika, kad ji prasmegtų” (Always that America, Let It Go to Hell, 1940), about the trouble one emigrant causes his old mother. When Cvirka writes, “I believe the reader will allow us to wander off the beaten path and graze our Pegasus in the lush grass at the side of the road,” we find ourselves mostly agreeing that the grass is, indeed, pretty lush over there, and Cvirka is certainly taken to wandering. Cvirka had never been to America, so his New York is imaginary, constructed entirely from newspaper accounts, novels, and his encounters with ‘Americans’ who had returned to their motherland. Although Cvirka’s debts to writers like Dos Passos, Sinclair, and Lewis is obvious, his novel is more notable for its perspicacity than its minor inaccuracies. Kruk’s experience selling real estate with mortgages designed to sink the buyer echoed eerily in recent headlines regarding the mortgage crisis, even as it borrows from Sinclair’s The Jungle (1904). But Cvirka’s description of the services Kruk offers at his funeral parlor foreshadows the industry skewered by Jessica Mitford in The American Way of Death (1963). Cvirka himself ended up as a ambivalent figure in the canon of Lithuanian literature. Born into a poor farming family in 1909, his tangled legacy forms a metaphor for all the paradoxes and complexities of the Soviet era in Eastern Europe. He falls into the category of writers whose talents and idealism you can’t deny, but whose active involvement in supporting the Bolsheviks mars his current reputation. Like the poet Salomėja Nėris, he was part of the delegation that went to Moscow in 1940 to ask that Lithuania be accepted into the Soviet Union, an act many consider traitorous. He was widely lionized during the Soviet era, albeit posthumously. There is the postage stamp issued in honor of his 50th anniversary of his birth in 1959 (he hadn’t lived to see his 40th), the documentary films, the gushing volumes written about him as the ultimate social realist, the collected works, the numerous editions, and the many languages his works were translated into all over the Soviet Empire. 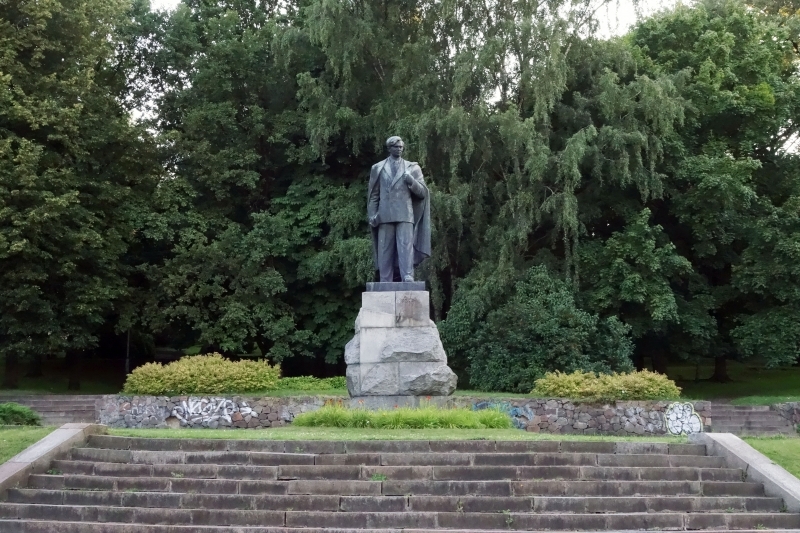 Unlike most Soviet heroes, however, his statue in Vilnius stands to this day, and at least ten towns have streets named after him. The museum of his birthplace is still open for tourists; his books, especially the early ones and those written for children, are still printed. Celebrations of his 100th birthday in 2009 included scholarly conferences and exhibits, and an award for literature is awarded every year in his name. Cvirka’s death is just as controversial as his life. Biographies and essays frequently pass over his early death at the age of 38 without comment. The true story of his death will probably never be known, whether it was related to his previous digestive problems or the ingestion of poisonous mushrooms—which some say was the work of the secret police—or whether it was intentional neglect by the hospital he walked to in the middle of the night. There were fine young men in the paper factory and in the sawmills. They most certainly found out that Pranas could put his foot behind his neck and reach his nose with his tongue. The paper factory’s bendas, or pipe orchestra, was just forming and wanted to recruit Pranas to beat the drum. But the Young Men’s Association, learning of Pranas’s talents, sent their chairman to visit him at home and invited him to join their organization. They promised him free entry into all their events, dances, and picnics, and if they liked his tongue and his foot on his neck, perhaps they would even pay him. Bobby, Pranas’s shift work friend at the sawmill, who was called Quickfoot, reasoned this way: If you’re going to join some association, you need to check out which one has the prettiest girls, the richest ones, which one has the most funds, and how often they organize dances, contests, and trips out of town. Bobby had a head on his shoulders, and once he told Frank that he paid no attention to whether a girl was rich or poor, let her be a senator’s daughter, he’d sweep her off her feet in the blink of an eye. This Bobby taught Pranas a couple of English words for how to pick up a girl. But Ben, another co-worker, was completely different. He didn’t have postcards with naked women, or the addresses of secret saliūnai, or newspaper clippings about the latest baseball games. What he carried in his pockets was a mystery. But Ben had a very poor opinion of Bobby. He called him a bomas, a driveler, a louse, and other names. Ben, who was no longer young, belonged to the socialists, and several times tried to start a discussion with Pranas. He looked like an ordinary man; he didn’t dress up much. He had strange peculiarities: if he bought a new hat, he’d sit on it first, and only then put it on his head. He was constantly reading the newspapers, and liked to tell jokes about priests, or even the president. To Pranas he seemed sincere, but when he sensed that all sorts of association representatives were inviting him to their entertainments and crowding around him, he immediately raised his price. If admission was free, why not go? Especially since Ben spoke so seriously. Maybe those socialists really did know how to make money easily, thought Pranas. And Pranas had a great desire to make money. The spirit of a new life immediately overcame him: running, racing, competing over wages, positions, and women. Everyone wanted to be first. Every day Pranas saw one and the same thing at home: a small metal savings bank with the image of a New York bank. It stood on the window and at every opportunity the bosas, his wife, and Mary stuck a cent, five cents, or even a dollar in it. Every Saturday the bosas went to the bank to deposit the money, and, on his advice, Pranas also opened an account. At home the talk was only about money, about savings. In the newspaper they read about the new rising stars in the financial world, about former ordinary street vendors. In this family’s life, illusions about sudden unexpected wealth had been broken and laid to rest a long time ago. And ninety-nine of a hundred of these petty American families built all their family’s fortune, friendship, entertainment pastimes, and future plans on the foundation of a savings account. The savings account at the bank was a constant, unchangeable member of the family. It was because of it that the bosas, the bučerninkas, and the barkeeper lived. Sacrifices were made to it, prayers and offerings were made by three-quarters of all America. The bank was king, an omnipotent emperor. Pranas couldn’t run away from it. And if he built plans for the future, hoped, dreamed; if he wanted to live the way they live in America, he had to choose a new fiancée—the Savings Account. Pranas got himself a piggy bank—a metal box—and each week he threw small silver coins into it. “Thrift,” said everyone, “is a guarantee in sickness, in fire, and in misfortune.” “Thrift doesn’t know death or bankruptcy” was written on the savings bank’s lid. The hall applauded and shouted hurrah. “In other words, they’re atheists,” thought Pranukas to himself. It was dull and dreary to him there. The worst of it was that these people didn’t honor the rich at all, and it seemed not a single one of them wanted to become a millionaire. No one looked at Pranas with greedy, surprised eyes; no one praised his tie, and probably no one would have paid attention if he had touched his nose with his tongue. These were completely different people than those at the other susaidės. These looked like tired, angry political conspirators. Then a new speaker, who attacked bosai and priests, stood up. He was relieved by Ben again. Pranas didn’t hear any more. He sunk into his thoughts and thought and thought. Bobby had urged him several times to run from that one-horse town, to take off across America. He told him about a miraculous land in the north that had to be reached by sled, where there were neither trains nor roads. There were mountains of gold there. Thousands of people go there and return millionaires. Bobby told him about California and Chicago, too. There are wonderful cities in America. In Boston he knew a trick for winning in a casino where he’d been three years before and won a half a million dollars, but he’d put it into a business and the money was lost. He was the only one who knew that casino’s secret, and, when he’d saved a bit of money, he’d be off there again. On Broadway there were big silver and glass buildings where millionaires’ daughters came to “get acquainted” with young beaus; then they went with them into baths of wine, and paid lots of money to beaus who danced and were educated. Now, there’s America for you! It wasn’t possible to believe Bobby entirely, but the bosas himself read about the glass buildings and the gold hunters in the newspapers. He wasn’t going to stay in that little town of sawdust and splinters. Two dollars a day. Twelve a week. Five dollars in the bank. How much would there be after five years? No, no! Far in the north there are mountains of gold, thousands of people are rushing there! But Mary? So wild, and so pretty anyway! When he purposely said that he was thinking of looking for work in New York or some other big city, she complained that he had never danced with her. Someone poked Pranas in the head with a finger. It was Ben. The speeches had ended, and he sat down next to Krukelis, asking how he liked it all and if he understood any of it, and would he want to visit with them more often. Pranas answered that he would think about it. Ben handed him some kind of little book. He found it only a few months later in his pocket when he changed suits, and while shaving his beard he kept tearing out a page at a time. It was written there: The History of the Workers’ Movement in America. That same evening, when he got home, Pranas said he’d been at a socialist susaidė mitingas. He said this intentionally, wanting to know from his bosas what kind of association it was, what they were screaming about, and what they wanted. To them, millionaires were no good, riches—no good, that someone else had too much—no good, too. Who were they, really? The bosas knew everything. The bosas, his relative, whom the Americans called misteris Gud, was reading the newspapers. This was a hardened Republican. Pranas listened, eating small bites, watching Mary, who arranged little colored pictures on the table and from time to time looked up at her father, or at Pranas. Pranas listened. He listened and didn’t know when Gudaitis’s speech ended. He swore to himself that he would be careful with associations. One of them was harmless: that was the Young Men and Women’s Association. They organized innocent dances, beisbolas and golfas games. But the bosas said, kreizi business, you need to learn an easier way to make a dollar. And Bobby said that there were mountains of gold somewhere in the north… but that in New York there was a glass house and a casino bildingas. And Mary once more mentioned that there would soon be another piknikas in the park, fifteen miles away, that her parents would allow her to go to. Dances and boats on the lake. How nice, Pranas! Cvirka mocked the broken Lithuanian of many Lithuanian-Americans by freely including LithEnglish words in his text. These have been indicated in the translation in italic, and, excepting a few minor corrections, retained Cvirka’s spelling. This vocabulary, however, caused problems for his readers in Lithuania. The Lithuanian-American vocabulary list was included in the 1949 edition of Frank Kruk and in all of its subsequent editions. © Deep Baltic 2017. All rights reserved.